Fire and Ice is the part of the acclaimed series Standing on Sacred Ground. Fire and Ice explores two mountain cultures fighting to protect their cultural and ecological heritage with the help of modern science. In the Gamo Highlands of Ethiopia, spiritual traditions that long protected trees, meadows and mountains are under attack by evangelical Christians. During a New Years bridal ceremony, tensions erupt into a riot. 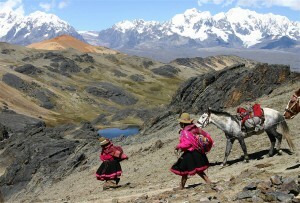 In the Peruvian Andes, Q’eros potato farmers face an invisible foe: global warming that is melting the glaciers, their only water source. They still make their annual pilgrimage to pray for abundance, and they are also building the Parque de la Papa (Potato Park), a community research farm to adapt indigenous agriculture to the changing climate. Stunning landscapes and vivid ritual scenes offer rare insight into little-seen, oft-misunderstood cultures. Narrated by Graham Greene (Oneida), with storytelling by Q’orianka Kilcher. Dr. Cecilia Martinez, Director of Research Programs. Dr. Cecilia Martinez previous positions include Associate Research Professor in the College of Earth, Ocean and Environment at the University of Delaware, Associate Professor at Metropolitan State University and Research Director at the American Indian Policy Center. Dr. Martinez has led a variety of projects to address sustainable development at the local and international levels. Her research is focused on the development of energy and environmental strategies that promote equitable and sustainable policies. She currently serves on the Climate Action Planning Steering Committee for the City of Minneapolis. Dr. Martinez has also worked with a range of organizations from local grassroots groups to international organizations engaging in the promotion of sound environmental policy and environmental justice. Most recently she completed an analysis of coal-based energy and environmental justice communities, and a review of climate adaptation and public health for the National Environmental Justice Leadership Forum on Climate Change. She has been appointed to several national advisory boards including, the National Advisory Committee to the EPA for the Council on Environmental Cooperation, and the Research Working Group for the National Environmental Justice Advisory Council. She is also on the leadership team for the national EJ and Science Initiative, and is leading the effort on a Truth and Reconciliation Commission on environmental harms. She is working on a manuscript on environmental justice and climate change and among her other publications is the co-edited volume Environmental Justice: Discourses in International Political Economy which includes some of her work on North American Indigenous peoples and the challenge of forging a common agenda of indigenous rights, justice and sustainability. She received her B.A. from Stanford University and her Ph.D. from the University of Delaware’s College of Urban Affairs and Public Policy, where she received the Ryden Prize for Best Dissertation in the Social Sciences.